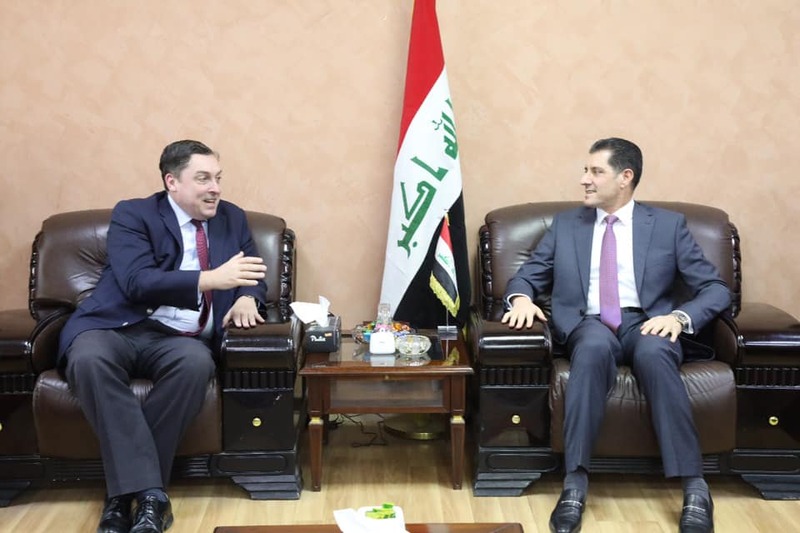 [ltr]The Minister of Planning Nuri Sabah al-Dulaimi received on Wednesday at the office of the British Ambassador to Iraq, John Wilkes, and the accompanying delegation. The meeting discussed joint relations and means of developing them to serve Interests of the two countries ". He added that "the Minister of Planning explained during the meeting the magnitude of the challenges faced by the government executive bodies, especially in the areas of economy and investment, while pointing to the need to support the efforts of the Iraqi government in the reconstruction and stability in the liberated areas." "Dulaimi made a presentation on Iraq's vision for the sustainable development of 2030 and the difficulties facing its objectives, while Dulaimi valued the great support the United Kingdom gave Iraq during the liberation battles and its efforts to achieve stability and the return of displaced people." The Minister of Planning, Dr. Nouri Sabah al-Dulaimi, received on Wednesday the British Ambassador to Iraq John Wilkes and his accompanying delegation. The meeting discussed joint relations and means of developing them to serve the interests of the two countries. The Minister of Planning during the meeting the size of the challenges faced by the governmental executive agencies, especially in the areas of economy and investment, while pointing to the need to support the efforts of the Iraqi government in the reconstruction and achieve stability in the liberated areas. Dr. Nouri al-Dulaimi gave a presentation on Iraq's vision for the sustainable development of 2030 and the difficulties facing achieving its objectives. Dr. Al-Dulaimi also paid great support to Iraq during the liberation battles and its efforts to stabilize and return displaced people. For his part, the British ambassador hailed Iraq's vision for sustainable development for 2030, announcing his country's development strategy to help the Iraqi government achieve economic reform, stressing that it is not saving any effort to serve Iraq. During the meeting, they discussed the humanitarian efforts to file the return of the displaced, the contribution of the United Kingdom to the financing of vital projects in the liberated areas, and the increase in international grants for the reconstruction of Iraq.